This article about Battlezone was contributed by Rebellion Game Designer Grant Stewart. Virtual reality is the cornerstone of Battlezone’s experience. It’s been built into every facet of the game. VR has certainly influenced the aesthetics and levels of Battlezone, but it runs deeper than that, into the game’s DNA, and right through to the moment to moment gameplay. Every pull of the trigger is tweaked for the PlayStation VR headset. Battlezone features over 100 weapons across a whole range of types. They have to be unlocked and it takes repeated playthroughs to gain access to the game’s complete arsenal. Once you’ve unlocked them, weapons will become randomly available to acquire as you progress across a map. We wanted to ensure you get an interesting selection of weaponry each and every time you visit the shop-like supply points. To that end, each weapon has unique strengths, weaknesses and costs, each one intended to fit a different purpose. Your primary weapons are all projectile-based, with every shot individually tracked and modelled. The enemy’s weapons are the same, just like the original arcade game. This is ideal for combat because it means you can manoeuvre and dodge away from incoming fire. You get time to see shots coming towards you and either get clear or blast them out of the air. This way you’ve always got a response to the enemy that extends a little further than a straight “shoot or be shot.” It’s important because rounding a corner and getting cannon fire in the face can be rather overwhelming in VR! Returning fire with projectile weapons adds extra tactical decisions too. Your shots don’t automatically hit their mark. You have to account for speed, the enemy’s direction, recoil and gravity, all of which add variety to combat that out of necessity takes place on wide plateaus. Once you’ve mastered it you can fire off a shot, know it’s going to hit its mark, acquire a new target and blast that too before the first shot has landed. The combat is designed intended to draw thrills out of action while avoiding nauseating terrain and twitchy insta-death. As well as machine guns, missiles and cannons you’re armed with a range of special equipment. These tend to be more strategic in their utility. You can fire an EMP that stuns all the AI around you, for example. Virus persuades enemies to fight alongside you. Rot bleeds enemies out over a period of time. They’re a panic button that opens up gaps in the battle, but they also setup opportunities for your teammates. For instance, you can EMP a tougher enemy to let your pal rush in and Vampire it for some health. With the PSVR featuring a built-in mic, we knew we wanted to create online combat with an emphasis on teamwork. We created specific special equipment to encourage this kind of camaraderie and communication. If you’re running low on ammo, have one player keep the Ammo Replenish ability handy. Everyone exploding in minefields? Equip a friend with Minespotter. Co-ordinating abilities with team mates and planning ahead adds tactical nuance to the frantic combat. Look Up In The Sky — It’s A Swarm! We’ve also designed the enemies to take advantage of the hardware. We’ve got all the opponents you’d expect in a tank combat game: Different flavours of heavy armour, smaller, more nimble scout unit, flying drones and more. The airborne adversaries are particularly important because they force you to look up, something that does not come naturally to those of us used to traditional games. We take this as far as we can with the Swarm, a swirling shoal of tiny missiles that undulates and eddies across the sky. The Swarm has been a feature since our first E3 demo. We used the Swarm to call an end to proceedings and get one last wow out of your limited time with the hardware. In the full game, Swarms take away your radar, meaning you have to look to the heavens and hunt for their intimidating silhouette. This re-creates that experience from the demo but in a more organic way. We hope you’ll pick up Battlezone and are as thrilled by the combat as we were to be building it. We’ve worked hard to make sure every bit of the game plays to the strengths of the VR experience, that everything suits the medium and the game encourages you to dive back into your headset. 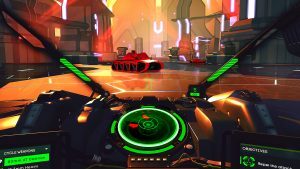 Just as the arcade original is at its finest on native hardware, Battlezone is a unique experience on PSVR. Grant Stewart designs games at Rebellion. Nobody seems to have stopped him yet. You can follow him on Twitter: @Darrigaz.